Deluxe reconditioned machines at less than half price. Looking for value? Why buy online when you can get these amazing bargains with local warranties, service, and classes. Fully serviced before going to a new home. Less than half the original price. These can sell fast. With a little notice we can bring it to the other store. Elna 8300 embroidery only machine with update to Elna 820 features. Embroiders 5.5" x 8" with onscreen editing and USB input. Demo model. $899. 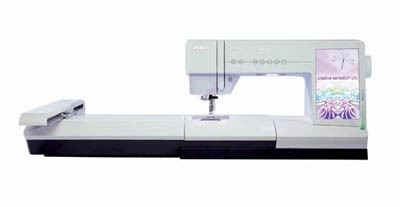 Elna 9600 sewing and embroidery machine with USB ports and 8" square hoop. $1599. Bernina Deco 340 embroidery machine with USB port, built-in designs, 5.5" x 8" hoop size $699. Watch this space for more clearance values.